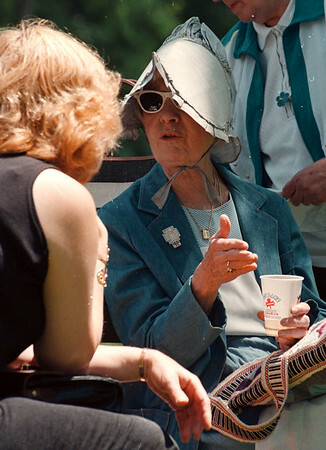 6/19/97--ART PICNIC--DAN CAPPELLAZZO PHOTO--WEARING A 100-YR-OLD HAT MADE BY HER MOTHER AND SAVED FOR SPECIAL OCCASIANS 78-YR-OLD JEAN HACKENHEIMER, OF N.F., SPEAKS TO JACKIE MOYER OF KENMORE. AT THE NIAGARA COUNCIL FOR THE ARTS PICNIC AT CARBO. CENTENIAL PARK.